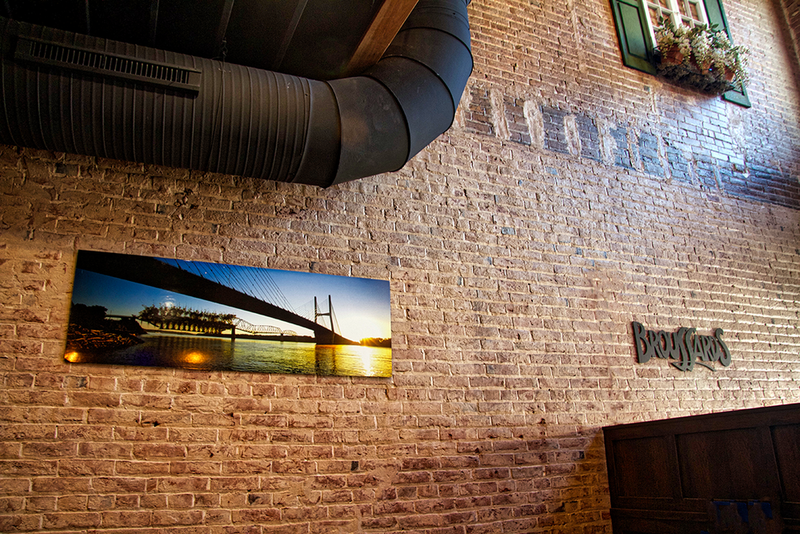 Renovated a vacant building in downtown Cape Girardeau, MO from an antique store into the new home of the New Orleans inspired restaurant, Broussards. My obstacle was to resolve how to blend the opposite sides of the New Orleans, Louisiana spectrum. Her love of the formal white collar, French Quarter/Garden District and his love of the blue collar, Bayou. 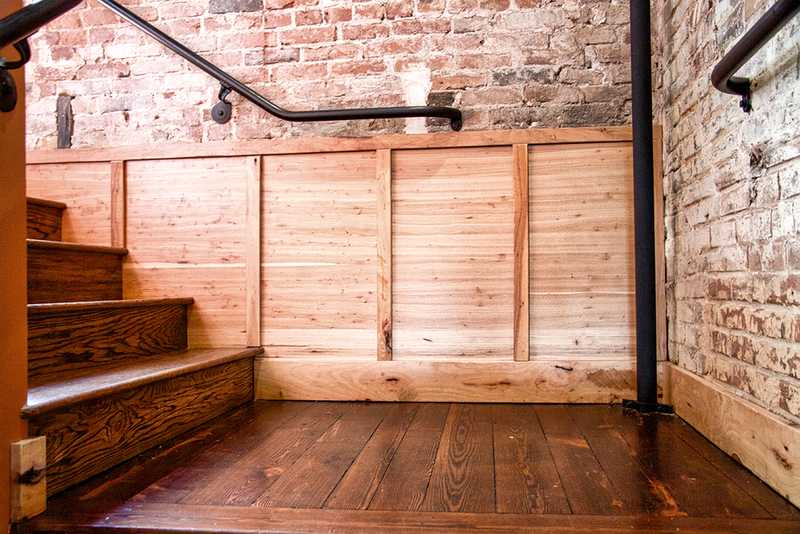 Set inside a newly renovated space that could’ve very easily went in the industrial direction with its exposed black duct work and brick walls. Stephanie and Hunter Clark purchased Broussards in 2004 and are still trying to keep the traditions alive that founders Mr. Barron T. Broussard and his wife, Kathy instilled back in 1986 when Broussards first started. 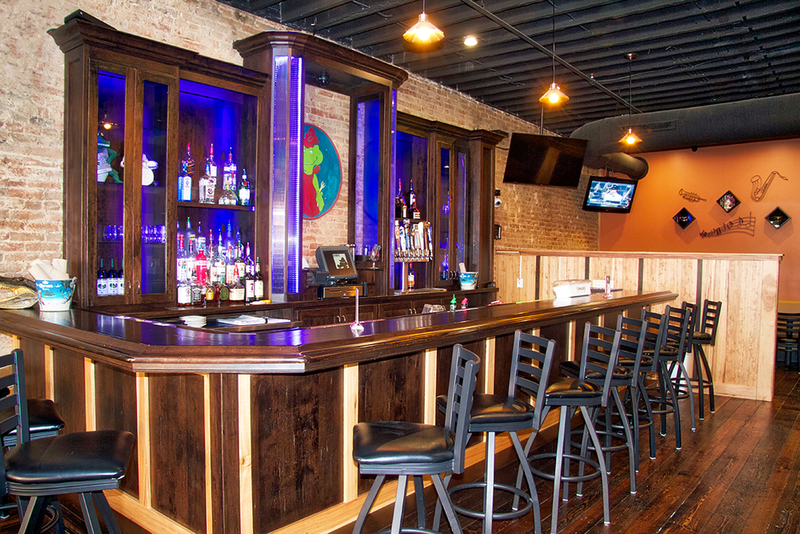 They have strived to provide both consistent and quality food with excellent service. 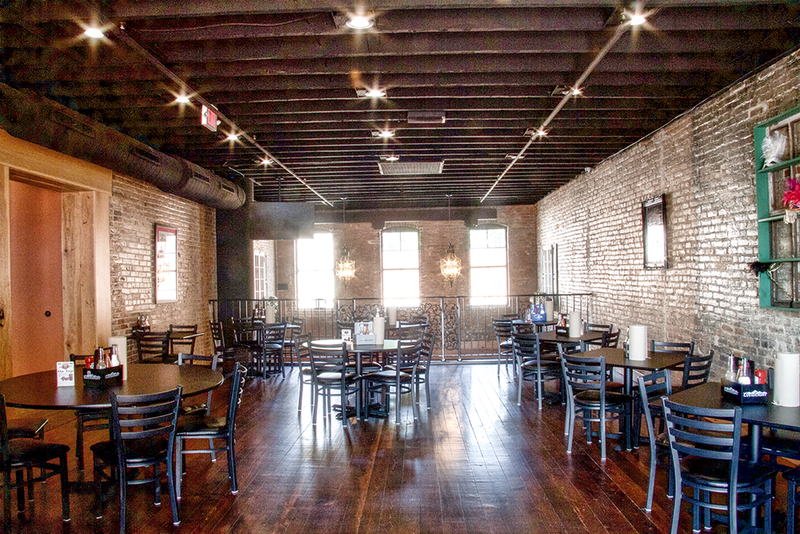 In order to provide more of a family atmosphere versus the bar crowd, Broussard’s no longer hosts live entertainment and no longer displays the gator tank due to various health code reasons and maintenance, but Felix de Gator remains as their mascot. So with the many changes and wanting a face-lift, Stephanie and Hunter decided to start with a blank slate by moving literally threes doors down the street on Main. • The entrance/waiting area. The ambiance when you first walk in the door and look up is that you’ve actually walked outside into a court-yard down in New Orleans. 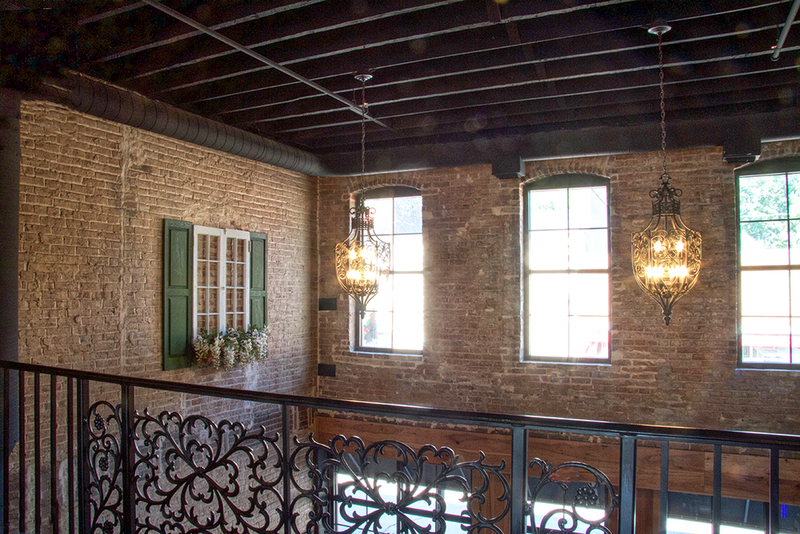 Faux windows with shutters and window planters have been mounted to the exposed brick to give the illusion that you’re looking at the backs of other buildings, two exterior lanterns hang down from above a dark sky (aka black ceiling) and the infamous balcony with the ornate black iron handrail. • The Stone Peak Palazzo tile was a perfect match for merging the formal and casual looks that both Stephanie and Hunter were after. This collection’s accent tile has a formal pattern, but the field tile has a rugged denim look and everyone loves it. We used the Antique Cotto (brown) field tile in 12x24’s to create a boarder in the hallway to the restrooms that carried into the men’s and women’s restrooms. The accent 12x12 tile was installed inside the boarder in the hall floor and repeated in the women’s restroom with a coordinating lighter field tile on the wall. • The ADA vanities in the restrooms. 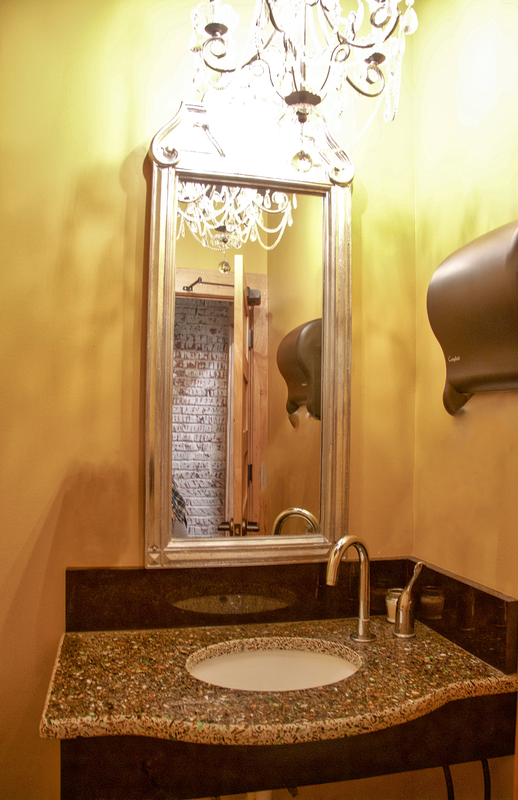 We wanted the vanities to dress up the restrooms, but they needed to be easy to clean and lighter scaled. I had the contractor add extra supports in the walls knowing that we would be installing the countertops on a wall mount frame that needed to be self-supporting. Once the frame was constructed and the tile was installed, very specific directions were given to the countertop fabricator, they were cut and installed with black iron cabriole legs and coordinating faucets to finish the look. I felt like I found a middle ground for Stephanie and Hunter. I had to find a way to merge her love of the formal white collar, French Quarter/Garden District and his love of the blue collar, Bayou. They were already under way when I was brought in on the project, so I had to get to work. I had seen a tile collection along the way that was perfect, I showed it to the couple and they loved it. Stall partitions, paint colors, coordinating tile, flooring stain color, ceiling tiles and countertops all stemmed from that one decision and everything else (faucets, mirrors and light fixtures) was quickly tackled in a few meetings here and there. Stephanie had existing accessories and memorabilia that she had been collecting through the years that she wanted to use and install. I feel like even though the new location has a nicer feel, it’s not too formal and the blue collar guests feel very comfortable, especially in the now, smoke-free environment.